Wrap the sausages in the bacon and fry in a saucepan until they’re evenly browned and the bacon is crunchy. You can also prepare them on the grill if you like. Place the sausages on a dish and let cool a bit. Cut each sausage into 5 pieces and place on a dish with the skewers or toothpicks. Serve these delicious sausages with sauces like ketchup, BBQ and mustard. You can also serve with gua-camole and chips. You can use any type of sausage you like. To make sure the bacon is fastened to the sausage when you fry it, just start on the first fold to prevent the sausage from moving. You can also fasten it with a toothpick. 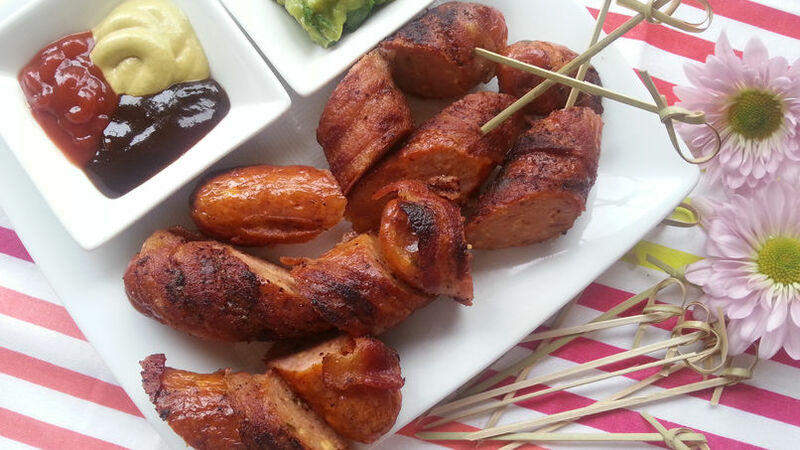 Adriana Martin Summer invites us to enjoy BBQs and what better way to take advantage of this than by preparing this simple and appetizing bacon wrapped chicken sausages. In this recipe I’m using gourmet chicken sausages that I found at the supermarket, but you can use any sausage you like. I invite you to cook with me!